Power monitoring and other parameters of the power system remotely via the Internet is a real need and is increasing in recent times. Especially after sending electricity prices increase, many plants have effectively save power after monitoring results. With power system remote observation, we can see the parameters of the power system as voltage, current, frequency, power, power factor, of plants or parts of any when we do not need to be present at the factory. We can use a computer or mobile device that supports web browsing is possible to observe the parameters of the electrical system of your plants. The versatile clock collects the electrical system parameters. Communicate directly to your network TCP / IP or via the device / intermediate adapter. 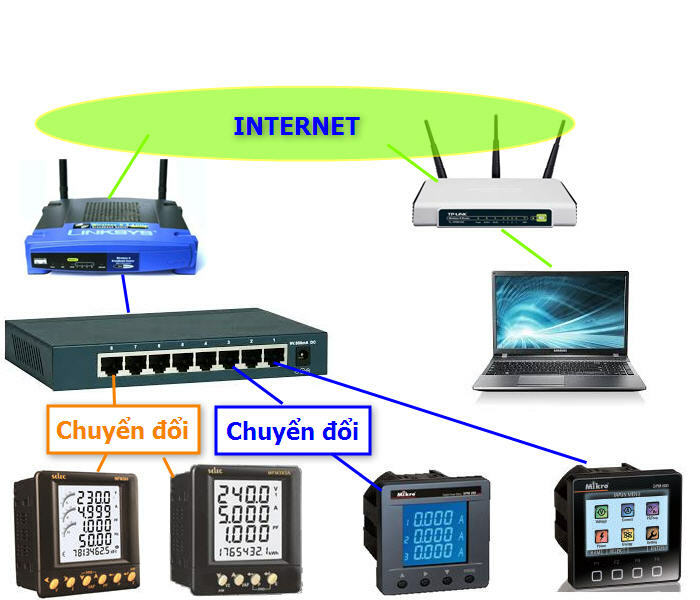 The Switch / Router help devices communicate Interner environment. If interrupt transmission line Internet access, these devices will form an Ethernet network. We can monitor the parameters via TCP / IP if the observation equipment and network layers. As observed in the Internet environment, observation equipment required is a internet connection. Adress : Xom Dau, Xa Di Trach, Huyen Hoai Duc, Ha Noi. Any questions please contact directly to the hotline of our company for the best advice !